Washington, D.C. – A follow-up to an earlier study of the effects of “deeper learning” in high schools conducted by the American Institutes for Research (AIR) confirms that students who attended network schools with instruction focused on deeper learning graduate at a higher rate than their peers. 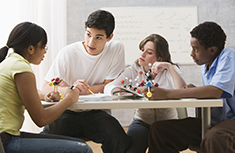 Using a sample that includes additional pairs of network and non-network schools, and an additional group of ninth-grade students, this study confirms the graduation rate findings of the 2014 report, “The Study of Deeper Learning: Opportunities and Outcomes.” That report also found that students in high schools focused on deeper learning scored higher on standardized tests, were more likely to enroll in four-year and selective colleges, and had higher levels of collaboration, self-efficacy and academic engagement. The new study, Graduation Advantage Persists for Students in Deeper Learning Network High Schools, can be found at www.air.og/resource/deeper-learning.